The Ladder of Inference is a model developed by Argyris & Schon* to explain how we all make inferences and reason about what is happening to us in the world. It’s value as a tool is not that it is necessarily correct, but that it is helpful in guiding understanding of how we work, and can help change behaviour in order to have more productive conversations in future. The next steps on the ladder relate to assumptions (take for granted that something is true without verifying it). We also make inferences by coming to conclusions about what we do not know on the basis of things we do know. The third rung is where we explain what we’ve selected and described. This is where we create a causal explanation for what is going on. We start to infer the reasons why the other person has said or done something. Words like “she’s doing this because …” or “the reason he did that is …” are signs that we are at this step. The next rung is where we evaluate how we judge the other person’s behaviour relative to our beliefs and values. We might focus on how effective someone else’s behaviour or whether it is is positive or negative. We evaluate the behaviour we see, but often also the other person’s intent (which is very difficult for us to be certain about). As we are not aware of the assumptions and inferences we are making, they can feel like facts to us, which means we don’t treat them as hypothesis and instead act on them as if they are true. The Ladder of Inference can be helpful in multiple ways. Often when we are in disagreement with someone it is because of a difference in the meaning or assumptions that we have arrived at. However, we often fail to see that we have applied different meanings or assumptions – we believe that what we’ve experienced is the only possible experience! Slowing down the inferential steps we have taken up the ladder can highlight the source of disagreement in a way that may make it possible to make more productive progress. When we are high on our ladder it increases the chance of misunderstanding and confusion. Being clearer about our own reasoning (by making public each rung on the ladder) reduces the chances of misunderstanding and confusion. When combined with an invitation for another person to inquire into our reasoning, it also makes it possible for us to find out errors in our thinking, which can lead to learning. It helps us reflect on the quality and effectiveness of our own thinking. A common experience is to find that we are high on our ladder, with an evaluation and judgement about someone’s behaviour or intent (in which case it is referred to as an attribution) without realising that we have low-quality input data. Further, high level inferences are often not possible to test publicly. For example, if I think that you’re incompetent, I wont be able to test it by saying “Gary, are you an idiot?”. It’s unlikely that Gary could provide an answer that we’d trust to this question. “Walking down the ladder of inference” helps us identify what it is about Gary’s behaviour that might lead him to this view in way that can be more easily tested (“Gary, when I asked if you were aware of the safety rules you said ‘yes’, but I see now that you are not wearing a safety hat. This leads me to think that you’re acting in ways that don’t make sense to me"). Yes, behavioural economics is great too! As are cognitive behaviour therapy, Kegan & Lahey’s Immunity to Change, Evolutionary Psychology etc. It’s a great time to be alive! thanks for writing a useful and original blog combining action science with other approaches such as Lean and agile development. 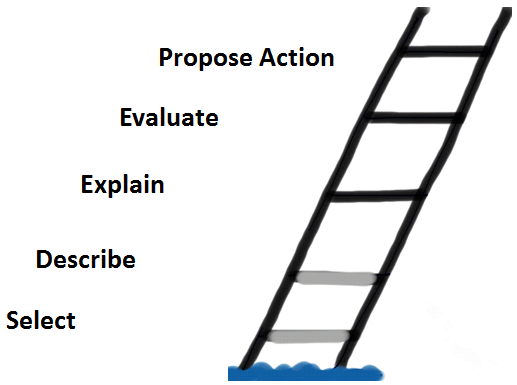 One comment regarding the Ladder of Inference, most of your examples suggest ways of moving downwards on the ladder, yet I assume a facilitator should also sometimes prod people to move the other way – for example, to infer general criteria from specific observations.